"Make it look easy. Everything you do should seem effortless and graceful." "No one should ever see your gums when you talk or laugh." "Your look should always have one thing left undone--the devil is in the details." "The Parisienne thinks she's a role model. She can fill blogs and books with life advice. In fact, she loves being asked what she thinks. And of course that makes sense because she's already done everything. Seen everything. She knows it all." "The Parisienne is always late. Unlike you, she has important things to do, she's a busy woman." "She never crosses the street where she's supposed to; she claims it's her rebellious side. People who wait in lines stress her out." "Parisian women never try to appear to be something other than what they are." This book. So funny, so pleasurable, so tres chic. I read this while commuting, and it is both entertaining and a conversation starter. Anytime I carried it around while on the subway, I caught people reading over my shoulder and received more than a few comments. There are tips such as How to throw a dinner party, What every parisienne has (or doesn't have) in her closet, How to act on a first date, or How to not go to the gym. I felt more sophisticated while reading it, and afterwards believed I was the “Parisienne woman” to a certain extent (the complexity, never crossing the street where she is supposed to, minimal makeup, lots of black, basic jewelry, and of course, her love for coffee and croissants). 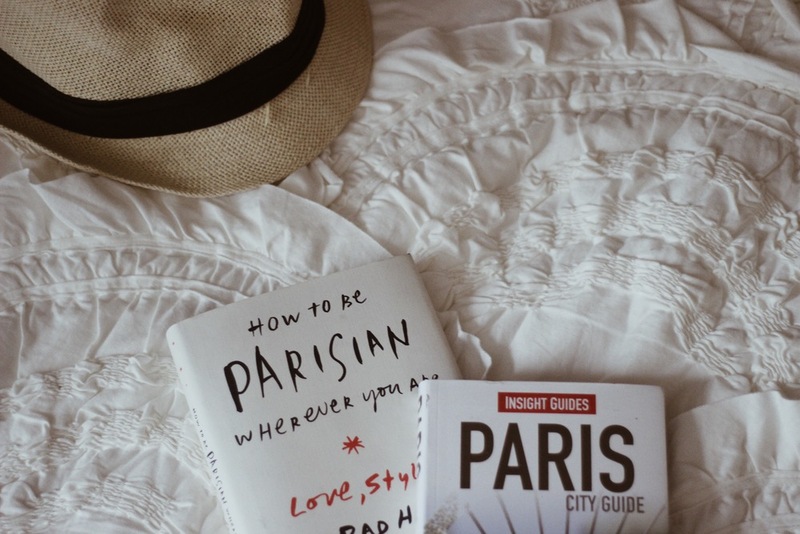 Overall, I think I am just in love with the idea of the fashionable, romantic, cultured, and sophisticated "parisienne woman" and l am simply in love with Paris. I also thought I'd use this post as a chance to share some exciting news...We will be traveling to PARIS IN MAY!! *insert lots of heart-eye emojis here* I am over the moon excited. Since moving to NYC, we realized how close we are to Europe (it's just right across the pond, right?) But seriously, we wanted to take advantage of it while we are here, especially since it is a direct flight and approx. 6-7 hours away. I began babysitting part time in addition to working my full time job last fall for some extra cash, and it allowed us to save up for a big trip, of which we chose Paris. Why? The history, the culture, the art, and most importantly, the food, duh ;). I cannot wait!